Aloha! It’s that time of the year again! Maggie Joe will be headed to Kona, Hawaii for the Hawaii Marlin Tournament Series. We depart Kewalo Basin and arrive in Honokohau Harbor in Kona on 6/26/12. While Maggie Joe is gone, as always Sea Hawk and Ruckus will still be fishing on Oahu. The Maggie Joe will be participating in the Hawaii Marlin Tournament Series, but will also be available for private charters as well. Please give us a call at 1-877-806-3474 to inquire about chartering the boat for a tournament or on one of the available private charter days. Check out Captain Mike’s tournament record on the Maggie Joe. 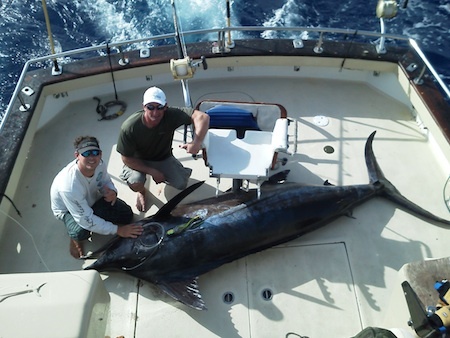 We go to Kona every year to catch big Marlin and win tournaments… come join us! Aloha!